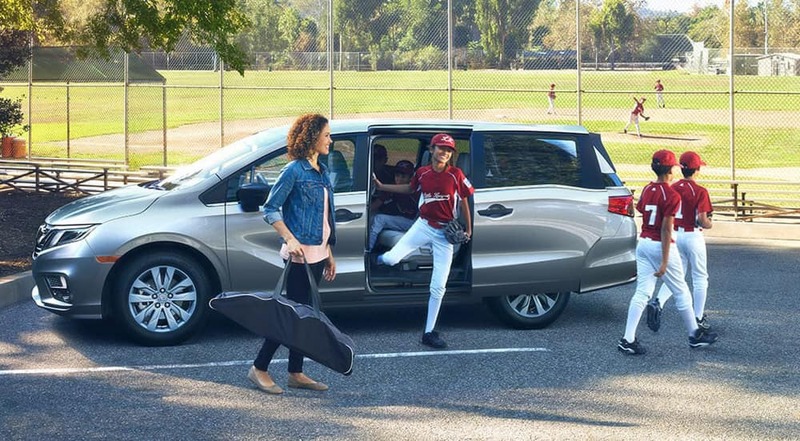 Drivers on the lookout for a family-friendly minivan need look no further! The 2018 Honda Odyssey has just arrived in Central Illinois, and according to one review from the folks at Car and Driver, this “practical, comfortable, configurable, feature-rich, and exceptionally quiet” minivan has everything you’ll need to feel comfortable on the road. Vehicle safety is one of the most important characteristics to consider when you’re choosing a minivan, and the 2018 Honda Odyssey’s crash test ratings speak for themselves! Both the Insurance Institute for Highway Safety (IIHS) and the National Highway Traffic Safety Administration (NHTSA) have honored the new Odyssey with impressive safety ratings, and once you’ve seen its array of safety features, you won’t have any trouble seeing why. The NHTSA performs a variety of collision tests that assess the Odyssey’s protective capabilities from nearly every angle, and in all categories but one, the Odyssey was found to offer 5-star protection. As a result, the NHTSA gave it a perfect 5-star overall safety rating. * The experts at the IIHS were no less convincing in their praise. This year, they’ve named the Odyssey, when equipped with available Honda Sensing and LED headlights, as a 2017 Top Safety Pick+ while drawing attention to its excellent, and accessible, intelligent driver-assistance features. Getting the safety features you desire is easy when you choose the Odyssey. For starters, almost all of its protective technologies are available right from the start in its baseline LX trim! Here, drivers will find LED daytime running lights, brake assist, vehicle stability assist with traction control, and even a multi-angle-rearview camera with guidelines. What’s more, Odyssey safety features that aren’t included here are almost all present in the next step up, the Odyssey EX. Among these, the most important is the Honda Sensing safety suite, which uses a combination of radar, cameras, and motion sensors to help you avoid collisions. Honda Sensing includes a collision mitigation braking system, adaptive cruise control technology, and much more. Take a Closer Look at the Odyssey! The 2018 Honda Odyssey’s crash test ratings place it in a league of its own. If you like what you’ve seen in this vehicle so far, take the next step by scheduling a test drive at your local Central Illinois Honda Dealer! With top-notch safety ratings and advanced safety features, this one-of-a-kind minivan is the perfect vehicle for your family. What’s more, with a little help from our current offers and financing options, it’s easy to find a way to fit the Odyssey into your budget. Contact us today to get started!